This is College Physics Answers with Shaun Dychko. Michael Carter, the US world record holder in shot put, threw the shot put at an angle of 38 degrees above horizontal and it travelled 24.77 meters. It started at a height of 2.1 meters. Our job in this question is to find what is the initial speed that he threw the shot put with. We know acceleration vertically is negative 9.8 meters per second squared. We’ll assume air resistance is negligible. To answer this, we’ll create some equations that have the initial speed in them and then see if we can solve for the initial speed. So let’s consider the horizontal dimension first. 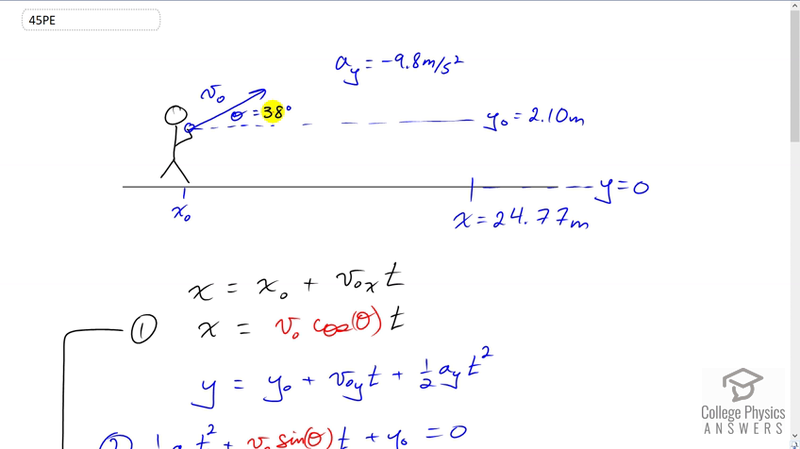 We have this horizontal position is the initial horizontal position plus the horizontal component of velocity times time. We can substitute for this by saying it is the initial speed multiplied by cosine of theta because that gives us the adjacent leg of this triangle. So it’s v naught x there. And that gives, x naught by the way is zero, so this horizontal equation reduces to x equals v naught cos theta times t. Now it has a v naught in it, so that’s good. Maybe we can solve for v naught but we don’t know what the time is, that the ball spends travelling. We can’t solve this equation since there are two unknowns. That means we have to find another equation and so we turned to the vertical dimension then. The vertical position of this ball is gonna be the initial vertical position plus the vertical component of its initial velocity times time, plus one half times vertical acceleration times time squared. This final y position is zero, so we can rewrite this and then just changing the order of things around a bit, to put the squared term first so that it resembles our typical quadratic equation. Which is of the form ax squared plus bx plus c equals zero. And so I have a thing times a variable squared plus another thing times variable to the power of one plus a constant term. I’ve also made a substitution for v naught y as v naught times sin theta. That being the opposite leg of this triangle. This equation we also can’t solve because we don’t know time and we don’t know initial velocity. But we can turn to equation one and solve it for t and then make a substitution for t in equation two and then we’ll be left with an equation containing only one unknown. Equation one version b is t equals x over v naught cos theta. Diving both sides by v naught cos theta there and then switching the sides around to solve for t. And then I replaced the letter t in equation two with x over v naught cos theta that we found from equation one. Now this is good because the only unknown now is theta. I’m sorry I should say the only unknown now is v naught. Because we know what theta is, it’s 38 degrees. So now we have an equation with one unknown. Excellent. So we’ll square this bracket and we have ay x squared over two v naught squared cos squared theta plus tan theta, we didn’t have to do that, we could have written sin theta over cos theta if you like but just simpler to write tan theta since that’s the trigonometry identity for sin theta over cos theta is tan theta. v naught is cancelled. We’ll multiply by the x there still, and then plus y naught, the initial height, equals zero. We have to solve this for v naught because that’s the unknown. We’ll get the v naught term by itself on one side of the equation and so we subtracted y naught and we subtracted tan theta x from both sides and leaving us with this line. And then we want to have v naught in the numerator and it’s hard to solve for it when it’s in the denominator. So we raised both sides of this equation to the same exponent, negative one, which means take the reciprocal. So this fraction flips over, putting v naught on the top, v naught squared I guess. Then this fraction flips over as well, although that might sound confusing because you don’t see a fraction but everything is always written over one, if you like, and so now that one appears on the top. I also felt like making the denominator positive, and putting the negative on top, that’s not necessary but that’s what I did. Lastly, we multiply both sides by ay x squared over two cos squared theta and do the same on the other side. That isolates v naught squared on the left. And then we take the square root of both sides and we finally have solved for v naught. So it’s the square root of negative ay x squared over two cos squared theta times y naught plus tan theta x. We plug in numbers and get our answer. So it’s square root of the negative of negative 9.8 meters per second squared, that being acceleration due to gravity, times 24.77 meters is the range of the shot put, and we square that, divided by two times cosine of 38 degrees, and then square that result, times 2.1 plus tan 38 times 24.77 meters and we get 15.0 meters per second, is the initial speed of the shot put.